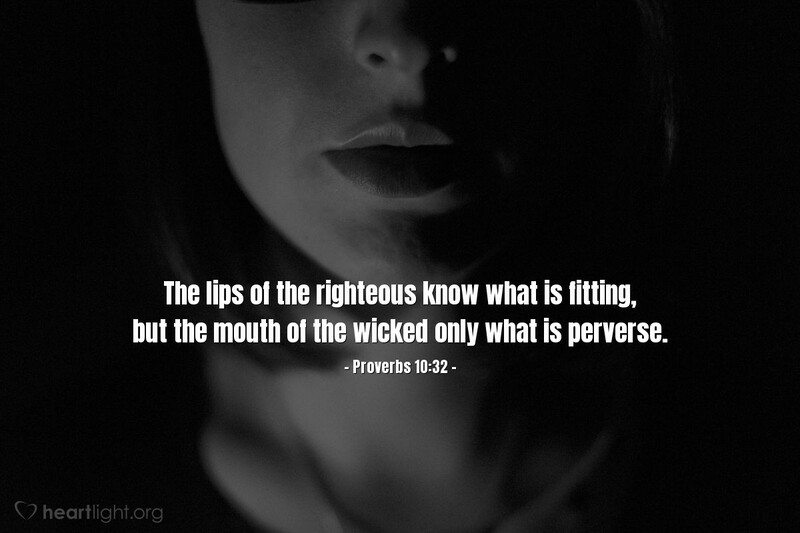 The lips of the righteous know what is fitting, but the mouth of the wicked only what is perverse. How many times have you said just the "wrong" thing? For me, it is more often than I would like to recall. Jesus words on this topic are indeed convicting to me: "Out of the abundance of the heart does the mouth speak." In other words, poor words and bad timing in our speech are more issues of our heart than issues of social skills and decorum. Let's ask God to purify, mend, and re-focus our heart on his will and passions. Almighty God, loving and merciful Father, please purify my heart of all evil, hate, duplicity, prejudice, malice, lust and greed. By the powerful name of Jesus, please drive away any evil power or enticing tempation that would corrupt my heart and wound my soul. Fill my heart with love, grace, righteousness, holy passion, gentleness, forebearance, sensitivity, courage, conviction, and forgiveness. Give me discernment to know which of these qualities are needed at any given moment. Sanctify me, body, soul, and spirit with your Holy Spirit. In Jesus' name I pray. Amen.